Danny Williams' second-half goal bolstered Reading's play-off hopes and heightened Charlton's relegation woes. The midfielder scored a 74th-minute winner to give Nigel Adkins' side a five-point cushion in sixth place despite having won just three in nine. Williams' finish from 12 yards, after Danny Guthrie burst from midfield, was the least the visitors deserved. It was a bad day for Charlton, though, with defeat leaving them just two points off the bottom three. Granted, Jose Riga's side have two games in hand on the bottom two and one on 18th-placed Barnsley but their inconsistency continues to be a concern. They have won three and lost three of their last six. Reading, though, are in better shape. Adkins's side have now taken 16 points from 18 on the road since the beginning of February and were always in control of this game. After a dreary first half, in which the only moments of note were when Charlton midfielder Jordan Cousins shot tamely at Alex McCarthy and Ben Hamer was forced to push away Chris Gunter's cross, the visitors took command. Williams, Royston Drenthe and Adam Le Fondre all spurned opportunities after the break and Guthrie's fierce free kick was saved splendidly by Hamer. Reading's pressure deservedly yielded a goal in the 74th minute, though. Guthrie burst from midfield and perfectly delayed his ball to Williams, who rifled the ball into the top-left corner. "We'll just focus on the six games left. You can see there's a spirit and a confidence about the players. "We only lost one game in March so it's not like we've been losing games but there's been too many draws. "If you give bad goals away like we have done, you won't win games of football - I think that's the top and bottom of it." "Before the game it was not an easy mission but we did it well - certainly for an hour. I think we had control of the game. "We didn't really see the difference between a team busy with the play-offs and one busy with relegation. "I'm sure the players have done what they have to do, but one mistake and you're punished." 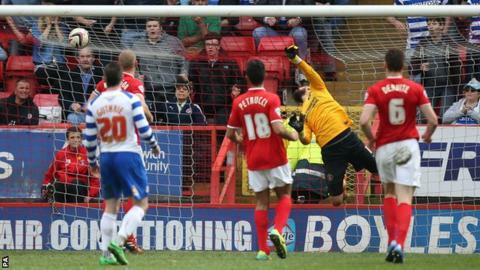 Match ends, Charlton Athletic 0, Reading 1. Second Half ends, Charlton Athletic 0, Reading 1. Foul by Davide Petrucci (Charlton Athletic). Daniel Williams (Reading) wins a free kick in the defensive half. Attempt blocked. Diego Poyet (Charlton Athletic) left footed shot from outside the box is blocked. Foul by Daniel Williams (Reading). Attempt missed. Reza Ghoochanneijhad (Charlton Athletic) left footed shot from outside the box misses to the right. Attempt missed. Reza Ghoochanneijhad (Charlton Athletic) left footed shot from outside the box is high and wide to the left from a direct free kick. Davide Petrucci (Charlton Athletic) wins a free kick in the attacking half. Substitution, Charlton Athletic. Jonathan Obika replaces Jordan Cousins. Corner, Reading. Conceded by Ben Hamer. Foul by Rhoys Wiggins (Charlton Athletic). Corner, Charlton Athletic. Conceded by Chris Gunter. Substitution, Reading. Hal Robson-Kanu replaces Adam Le Fondre. Daniel Williams (Reading) is shown the yellow card for excessive celebration. Goal! Charlton Athletic 0, Reading 1. Daniel Williams (Reading) right footed shot from the right side of the box to the top left corner. Assisted by Danny Guthrie following a fast break. Attempt missed. Pavel Pogrebnyak (Reading) left footed shot from the left side of the box is close, but misses to the left. Assisted by Daniel Williams. Offside, Charlton Athletic. Reza Ghoochanneijhad tries a through ball, but Simon Church is caught offside. Delay in match Danny Guthrie (Reading) because of an injury. Substitution, Charlton Athletic. Davide Petrucci replaces Johnnie Jackson. Attempt missed. Alex Pearce (Reading) header from the centre of the box misses to the left. Assisted by Danny Guthrie with a cross following a set piece situation. Pavel Pogrebnyak (Reading) wins a free kick on the right wing. Attempt saved. Garath McCleary (Reading) right footed shot from the centre of the box is saved in the centre of the goal. Assisted by Adam Le Fondre. Substitution, Reading. Garath McCleary replaces Royston Drenthe. Reza Ghoochanneijhad (Charlton Athletic) wins a free kick in the defensive half. Attempt saved. Danny Guthrie (Reading) right footed shot from outside the box is saved in the top left corner. Royston Drenthe (Reading) wins a free kick in the attacking half. Attempt saved. Rhoys Wiggins (Charlton Athletic) left footed shot from outside the box is saved in the centre of the goal. Assisted by Reza Ghoochanneijhad. Michael Morrison (Charlton Athletic) wins a free kick on the right wing. Foul by Adam Le Fondre (Reading). Substitution, Charlton Athletic. Reza Ghoochanneijhad replaces Astrit Ajdarevic.